Alternative names: Mauri, Maurikura (epiphytic Astelia spp. ), Kakaha, Kōkaha (several species of Astelia). (See also Related names, below). Kōrari, the flower stalk of the harakeke; in Taitokerau also used to refer to the entire plant. Proto Malayo-Polynesian *Pandan, Pandanus spp. Wharawhara (Astelia banksii), Pūwharawhara (Astelia banksii & A. hastata), Kōwharawhara (A. banksii & A. solandri). These have a separate page devoted to them. The four words in the main header to this page and the three related names all incorporate the Proto-Polynesian word *fara, inherited by Māori as both hara (as in harareke) and whara. (The same root word was the basis for a later reduplicated form, *falafala, used in the three related plant names and discussed on a separate page.) Both these words are derived ultimately from the Proto-Austronesian word *parangal, Proto Malayo-Polynesian *pandan "pandanus". Like the pandanus, the plants with names derived from *fara have sheathing, ensiform bases, illustrated in the pictures at the top of this page and on the linked page for the Proto-Polynesian word. Whara is a very special word-root for the Maori lexicon, as it is one of only two plant names with a reflex in Modern Maori which has come all the way from Taiwan, which is as far back as we can trace the origins of the Austronesian languages. There is yet another equally ancient word with plant associations which has found its way to Aotearoa, however. This is tupu (tipu in Eastern dialects), which in Maori now means, among other things, "to grow, increase" and "growth, shoot, bud". It is derived from Proto Austronesian *Cubuq, thought to have meant originally "a plant sprout", just as, five thousand years on, it still does in twenty-first century Maori! Like the aruhe (bracken fern), the harakeke is one of Haumia's children, thus connected to the beginning of creation where the earth is concerned in Māori cosmogeny. There are many varieties, selected for particular qualities -- softness of the fibre for clothing, strength of rope, permeability for dye, the colour of the dried leaf, treated or untreated, for basket and mat making, and so on. Murdoch Riley (Herbal, p. 126) comments on its use as an augury for healing: if the blade made a screeching sound wheb pulled from the base, the patient would recover. Similarly for predicting success at the start of a fishing expedition. The leaves had many other functions and roles in connection with ceremonies and customs concerning the spirit world, medicine and mortality. Every part of the plant had a use. When dry, the flower stalks (kōrari) bundled together made excellent temporary rafts, and also kindling wood. The fibre (muka) was superb for rope-making, and indeed after contact with Europe and America was for a while the foundation of a major export industry. In specially selected varieties, it was also an excellent material for producing fabric for fine clothing. The leaves also provided material for plaiting, bandaging, and splint making. Soot from burnt fibre was used to absorb blood during tatooing. Jelly from the leaf bases has antiseptic qualities; indeed, one commentator recommended boiling the lower part of the leaves and drinking half a cup of the juice as a "very effective" remedy for hangovers. The roots and rhizome were used extensively for treating boils, wounds, and other lacerations and skin eruptions. Decoctions of the rhizome were also used as a purgative and for a variety of stomach disorders (but caution was required because of the strength of the purgative properties). Roasted roots were widely taken (by Māori and settler alike in colonial times) as a remedy for "costiveness" (constipation). By itself, the word whara in Māori refers to all plants having "ensiform" (sword-shaped) sheathing leaves, reminiscent of the tropical Pandanus. This arrangement is chartacteristic of the flaxes (Phormium species and cultivars) and Astelias. It is illustrated in the two photographs above, and in some of those on the linked page discussing the Pacific namesakes of these plants. 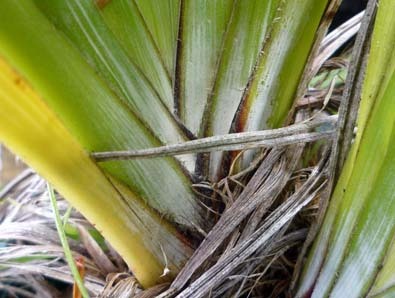 In the specific names of several species of Astelia, the Māori word root is doubled (reduplicated), which is a development that took place in Eastern Polynesia before the settlement of Aotearoa. These names and the plants they refer to are illustrated on a separate page, but some photographs of Astelia species also appear on this one as the name for the group applies to them collectively and directly reflects its Proto-Austronesian source. (The names pūhara and pūwhara, also derived from this root word, are alternative names for one particular Astelia, A. banksii). There are two species of Phormium. 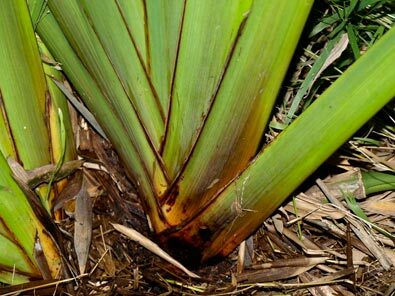 The larger, Phormium tenax (the plant most often referred to as "New Zealand flax") has the Mäori names harakeke and also whararahi (literally, "large whara" - according to Williams, a name applied to a particular variety "not of the finest quality"). 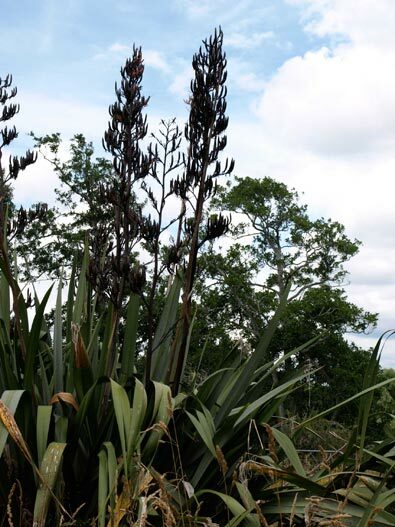 In Northland the plant is commonly called kōrari, the word used only for the flowering stalk elsewhere. This species is also found natively on Norfolk Island. The wharariki ("small whara), Phormium cookianum, is unique to Aotearoa. Both species have long been cultivated, and the cultivars vary widely in size and colour. Plants of the two species look very similar when not in flower, although most (but not all) varieties of harakeke are larger in size, and their habitats are different -- P. tenax prefers moist soil near streams, lakes and swamps, while P. colensoi is happiest on hillsides and among rocks. When flowering they are easily identified. The flowers of Phormium tenax reach for the sky, whereas those of P. colensoi point earthward. Unsurprisingly, for such an important plant, flax plants and their parts and products feature in many proverbs and songs. Here is a small sample. Unuhia te rito o te pū harakeke, kei hea te korimako tangi ai? If you pluck out the heart of the flax bush, where will the bellbird sing? Unuhia i te rito o te harakeke. Aitia te wahine o te pā harakeke. Me he tapa harakeke; me te tapa Harakeke. Tū ake e hine, i te tū wharariki. Arise now O maiden, arise from the soft flaxen mat. The leaf of Hunā -- the finest fabric. (M&G 2420). An alternative view is given in notes to some of the songs in Ngā Mōteatea referring to the relative qualities of fabrics produced from whara and kiekie (a member of the Pandanus family), however. For example, "Rau kiekie: E tino mahia hei pūeru, he taratara ki te kiri." Kiekie leaf. Cloaks are woven from it; it is smoother than one of flax. (Note to NM 209, v.3, pp. 42-43). The same song also mentions the medicinal gum of the flax (te pia o te harakeke). Kei te whakataikī rā, 'Rukuruku Huna, horahora Papaka-nui'; he whā tāwhara, ara he roto kiekie a Huna. "Huna" (also spelt Hunā and Huunaa in some versions of the saying) and "Pāpakanui" may have been legendary places; I have not been able to find any information about their geographical location. There is a Papakanui river and sandspit in the Kaipara harbour, but they are unlikely candidates as the saying is from the Eastern Bay of Plenty. References and further reading: There is information on each of the Phormium and Astelia species in the NZPCN database. Elsdon Best has a comprehensive list of names for varieties of Phormium, as well as terms for parts of the plant, in his Forest Lore (pp. 100-103). 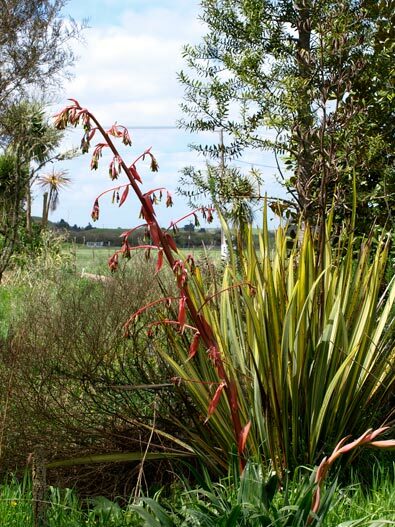 There are many accounts of the medicinal properties of the harakeke, Phormium tenax, as well as of some species of Astelia, in Murdoch Riley's Herbal, the plants are also mentioned in general works on the NZ flora listed in the bibliography. Photographs: The photograph of Astelia solandri is used by kind permission of the photographer, Jesse Bythell, NZ Plant Conservation Network. The others are of plants in Te Māra Reo.